Sainsbury’s Comic Relief Cookie Challenge! I’m always keen to get creative so I was happy to join in the fun. Five runners up will be picked from all the designs, Sainsbury’s Facebook fans will then vote for their overall favourite design to feature on the Comic Relief baking page. This year Comic relief is all about Dinosaurs (with toes), so with this in mind…. Watch out there’s Dinos about! 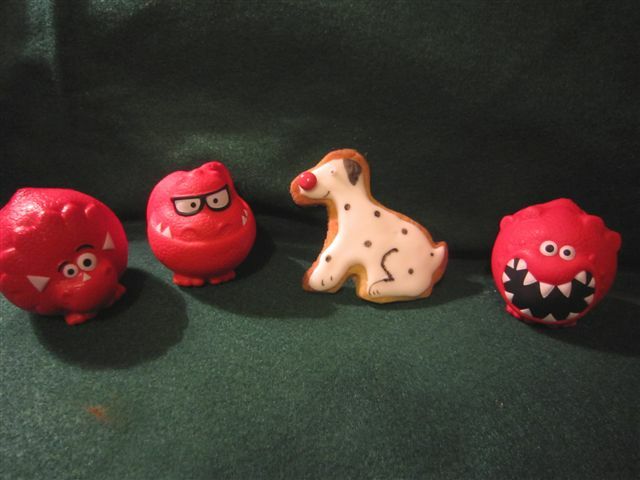 Two of these dinos are sporting red noses and one has taken inspiration from the aptly name T-Spex red nose character. Rub together the butter and flour until it resembles breadcrumbs. Add in the vanilla extract and caster sugar and bring together with your hands to form a dough. 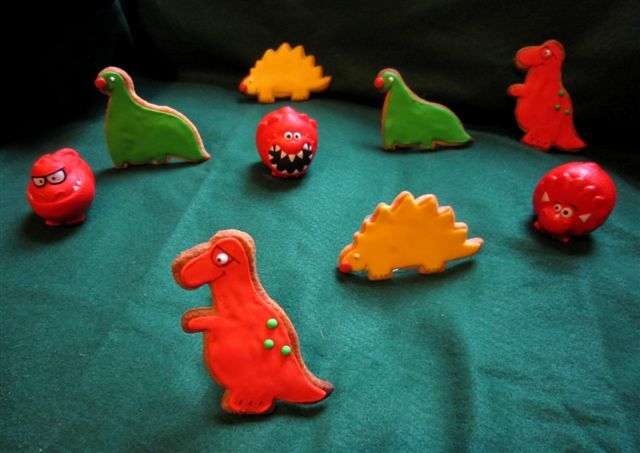 On a lightly floured surface roll out the dough, then cut out your Dinos. Bake for about 10 mins in a 170C/350F oven, keep an eye on the biscuits to make sure they don’t burn. Mix up the royal icing. I usually devide this between several pots so I can mix up multiple colours. 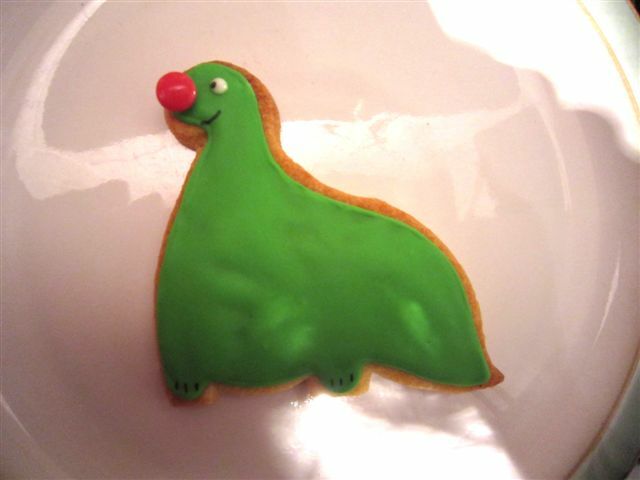 Using a fine piping bag ice the background colour onto your Dinosaur, you can also spread it on if you’d prefer. Leave for several hours to harden. Once dry add a small white blob of icing to make the eye and leave to harden. Once dry add any final details such as smile, toes and pupil. The biscuits can take several hours to dry out completely, but it’s worth the wait as they can be stacked into a tin once finished without sticking together or damaging all your hard work! 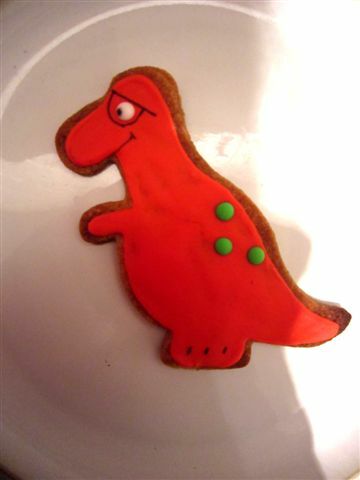 Of course you can also customise your biscuits to make many other red nose characters. 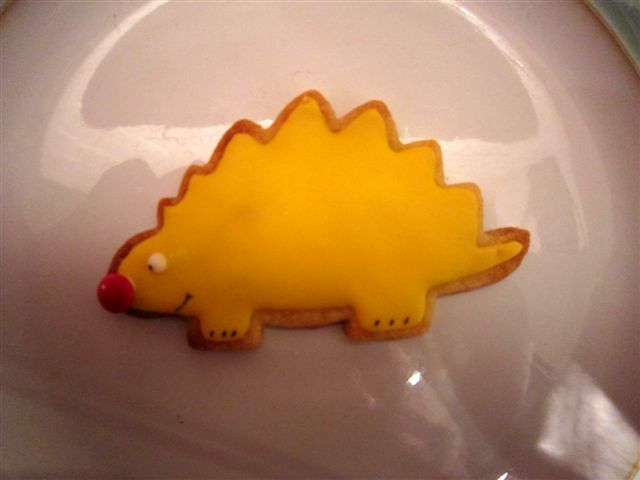 Our very own Spotty Crocodile made it into biscuit form sporting a dashing red nose! With the party season fast approaching many of us will find ourselves travelling to see family and friends, with this in mind today’s guest post from the Sainsbury’s Money Matters team is sure to come in handy. Not many of us look forward to a long car journey, but if you or the kids are prone to nausea on the move, it can make even relatively short trips total torture. Feeling or being sick as the result of a car journey is a form of motion sickness. It occurs due to a conflict in what you’re seeing and feeling – your eyes see that you’re sitting still and the car interior appears static, so the car’s small movements and the changing view confuse your brain, upsetting your inner ear. It’s particularly common in children, but they often grow out of it. Firstly, don’t have a big meal or anything too rich just before a long journey, as this can make nausea more likely – and avoid alcohol. Ginger root is a great stomach settler, so to ensure your tummy is tiptop before a trip, take a ginger capsule, available at chemists and health stores, or sip ginger tea. 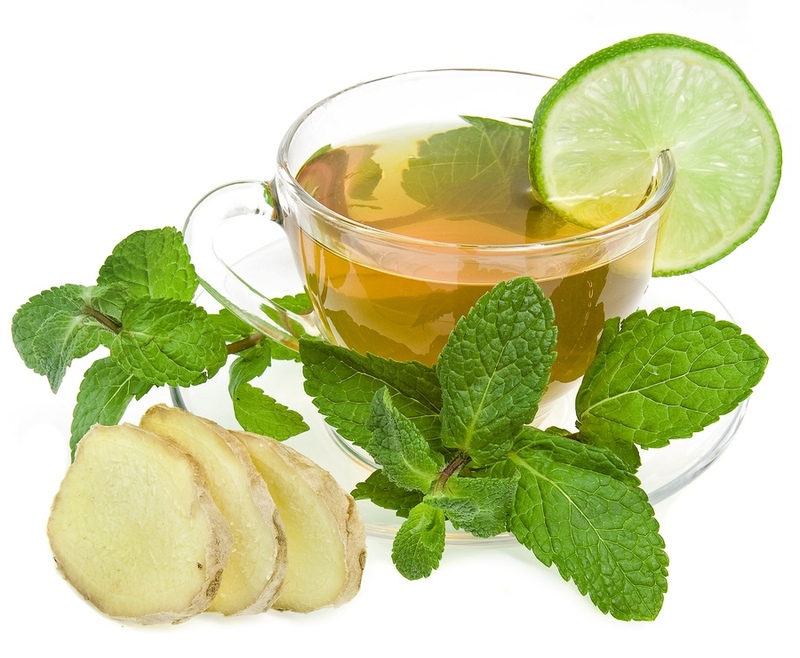 Alternatively, some people find peppermint or fresh mint settles the stomach, so try mint tea too. Need something stronger than tea? Then pop to a pharmacy and grab some motion sickness medicine. Make sure you take it at the recommended time prior to getting in the car, as it tends to be preventative rather than curative. Be aware that travel sick medication often causes tiredness, so if you intend to drive, go for a non-drowsy formula. Alternatively, try an acupressure wristband, which is said to both prevent and alleviate nausea. Before you set off, ensure the car is free of smells that might unsettle the stomach. If you or other passengers start to feel sick mid-route, the smell of musty air, air freshener, perfume or food may well make the symptoms worse. Ventilate your vehicle and spray a fresh lemony or minty fragrance. En route, one of the best ways to avert and alleviate car sickness is to look at the horizon. Gazing out the window will allow your brain to realise that you’re moving, while focusing on an object in the distance will ensure your brain’s not too disorientated. For this reason car sickness-prone passengers should sit at the front as there’s a larger window, but you may need to disable the airbag for a child. If a child has to sit in the rear, play games that require him or her to look outside, such as counting the number of yellow cars that pass. Adults who tend to get travel sick could consider driving, as drivers rarely suffer motion sickness – perhaps because they’re always looking ahead. There are a few things that will make the symptoms of car sickness even worse, so make sure you don’t focus on fixed objects if you get carsick as this is disorientating, and avoid reading anything. If you need to look at directions or a map, pull over. Equally, watching films and playing console games are out, as the moving images only confuse your brain more. Instead, listen to books on CD or sing along to music. This will help to drown out thoughts of nausea, too. One of the easiest ways to block out such thoughts is to sleep. Even if you don’t manage to doze off, closing your eyes will stop you concentrating on static objects. If queasiness does set in, eat ginger biscuits or try mint or lemon sweets – all popular remedies with children. You could also sip on a supply of ginger or mint tea. Wind down the window too for some fresh air, and take slow, deep breaths. Of course, regular breaks are vital, especially if you’re driving down windy country lanes. If this is the case, ask the driver to take the bends slowly and encourage him or her to drive smoothly so that you don’t speed up and then slow down too much. Another thing that’s sure to make you feel sick is not having adequate car insurance in the event of a car accident. So be sure to check your insurance policy covers all your needs. Tara Nathanson writes for Sainsbury’s Bank Money Matters blog on a range of topics including car insurance, car safety and other motoring topics. In her spare time she likes going to the cinema and doing yoga and Zumba classes, and at weekends she likes hanging out with her six-year-old son. We’ve been nominated for an award!! It’s been an exciting few weeks here at Angel Eden, I wish I could tell you about it all but a few things have to remain secret for another week or so. I can however reveal that we’ve been nominated for an award! The Angel Eden blog is now a part of Sainsbury’s blogger network and have been nominated for the brand new Family blog awards. Initially we have to ask for your kind votes, just hit the button below and vote for ‘Angel Eden Blog’. The finalists will then be put before the judges. Comments Off on We’ve been nominated for an award! !